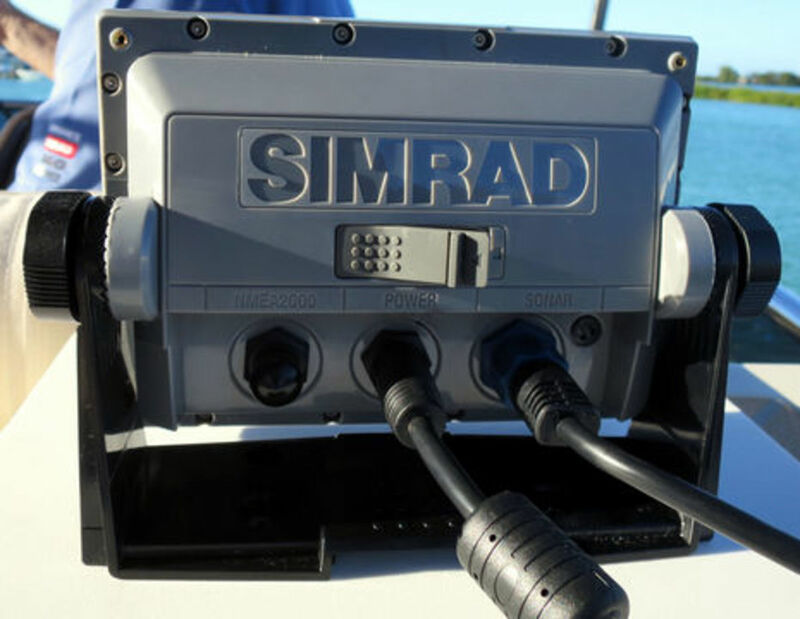 The brand new Simrad Go7 looks like an all-glass version of the Simrad NSS7 evo2 Combo, but its design may actually define an interesting new "standalone" glass bridge MFD style that trades some of the multi in multifunction for a much lower cost. 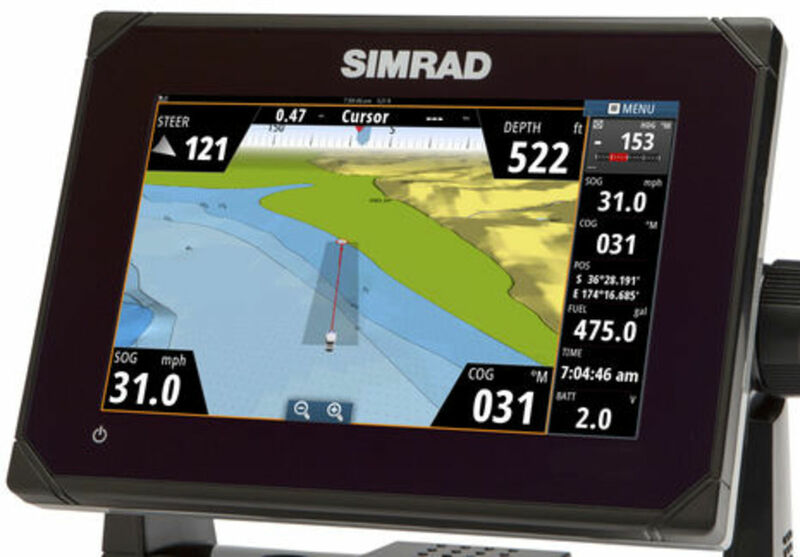 The brand new Simrad Go7looks like an all-glass version of the Simrad NSS7 evo2 Combo, but its design may actually define an interesting new "standalone" glass bridge MFD style that trades some of the multi in multifunction for a much lower cost. 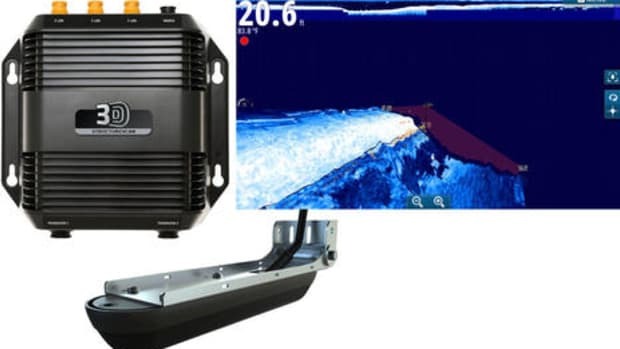 The Go7&apos;s suggested retail price is just $799 without charts or transducer, and its B&G Vulcan V7 sibling is also just $799 with an added bundle of sailing features. 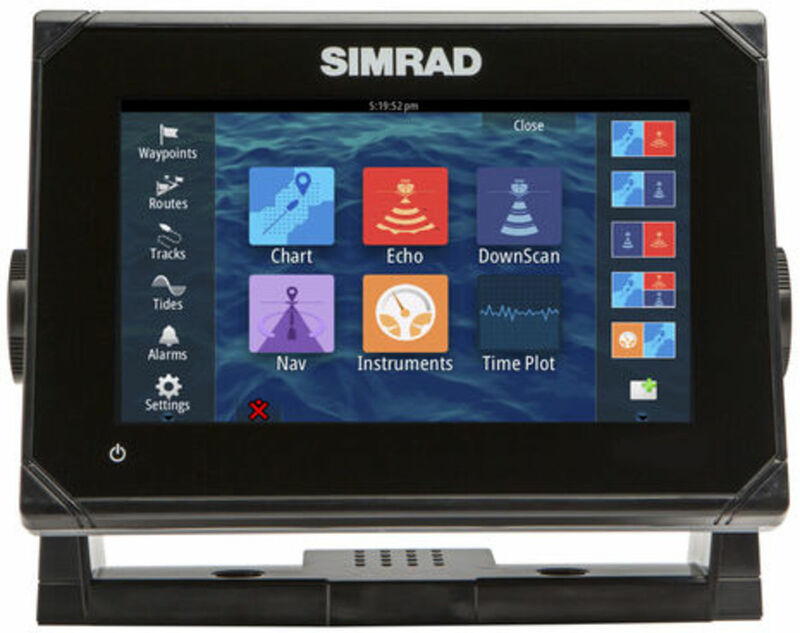 I put "standalone" in quotes -- and we need a better term -- because these chartplotter/sonar combos can make many useful connections over NMEA 2000 and WiFi, though they do not include the Ethernet needed to fully network with radars, other MFDs, and external sonar sources. The front is a different story. 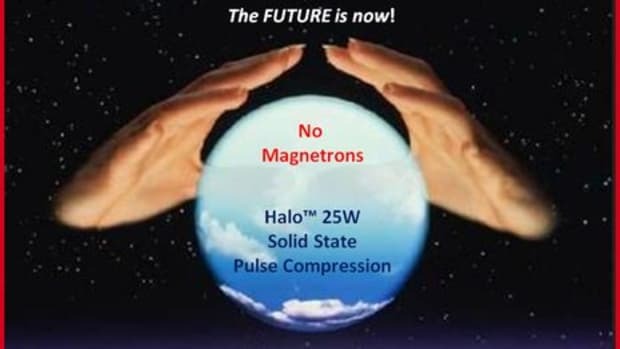 The product image above may be photoshopped (the 2.0v battery state is a clue ;-) but the Go7/V7 screen has the same nice specs as the NSS evo2 and Zeus2 7-inch models: 800 x 480 multi-touch pixels with 1200 nits of bright LED backlighting. 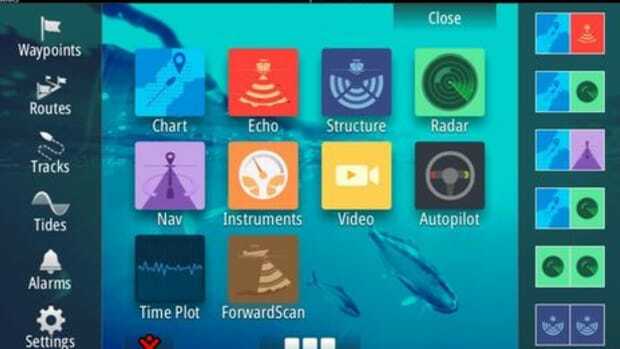 I also have the Go7 manuals and don&apos;t notice any feature of NSS evo2 that&apos;s missing in the Go7 except for the already mentioned items like radar, video, and NMEA 0183. 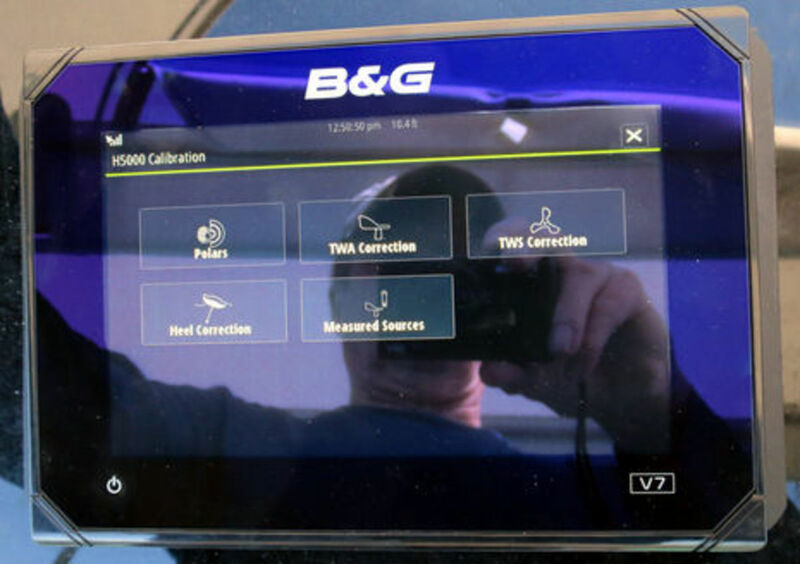 The main panel above, for instance, shows the neat Nav mode -- an elaborate "rolling road" screen -- that came with evo2, and you can split the display into 2, 3, or even four variable size panels plus the databar. 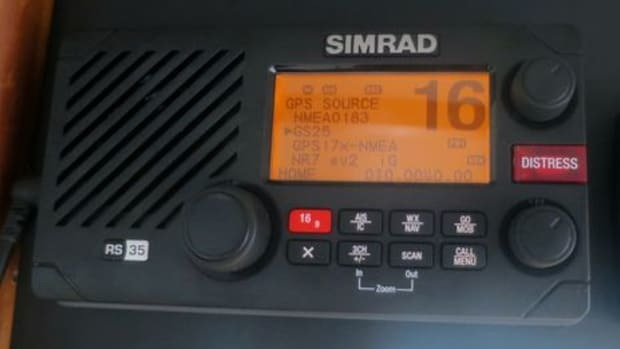 Note the databar&apos;s autopilot pop-up, which can also be a panel, and know that besides full AP support, the Go7 and V7 can use NMEA 2000 to interface with Fusion or Simrad audio, CZone digital switching and monitoring, and either Mercury VesselView or generic NMEA 2000 engine info. Of course, they can also display more conventional N2K data in myriad ways, and at least the Vulcan can fill the whole screen with one numeric value (or 2, 3 or 4). At $799, this 7-inch "standalone" is like a big IS40 (Triton) all-in-one N2K instrument display with a whole lot of extras thrown in! 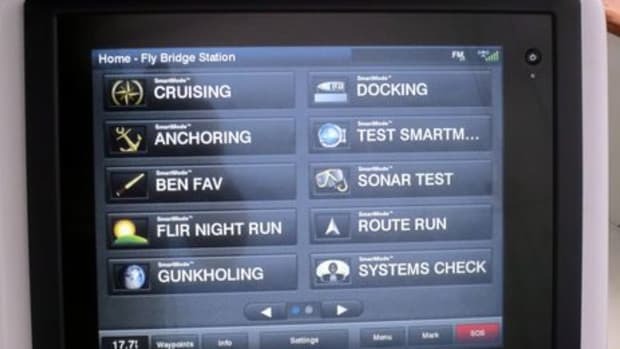 I can picture the Go7 or Vulcan V7 being used either as a standalone primary navigation system on a smaller boat or a nice accessory screen to a bigger boat system, but Simrad is emphasizing the former in its go-go Go7 video while B&G demonstrated the Vulcan in Florida on a sleek Beneteau Oceanis 55. You can see above what a regular chart screen looks like and the relative compactness of these glass displays compared to a big HS35 wireless handset (whose base RS35 VHF is also networked to the V7). 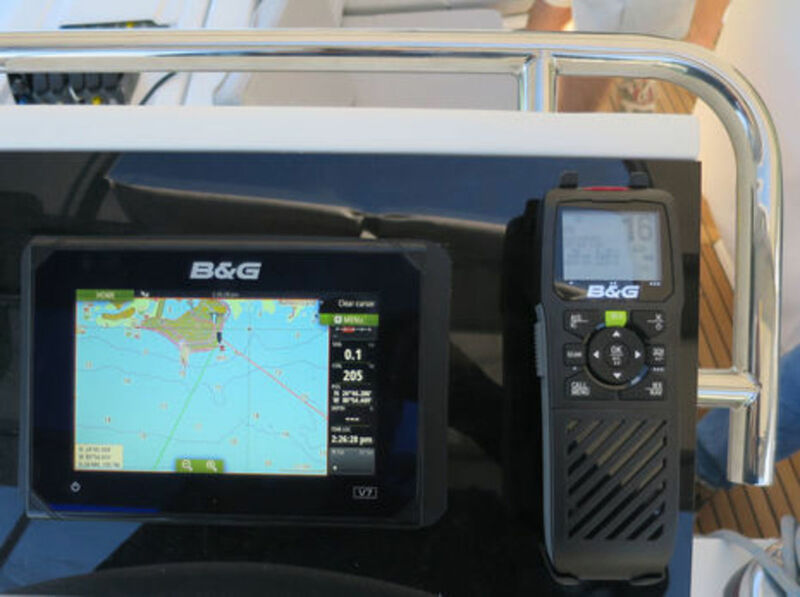 Sailors will like the V7&apos;s maximum 1 amp current draw (at 13.6v with sonar off), and anyone considering a Go7 or V7 might like to add an OP40 keypad for when touch controls are hard. I wouldn&apos;t be surprised to see smaller, less expensive N2K keypad options eventually, and these MFDs also have Bluetooth, which makes wireless remotes also a possibility. 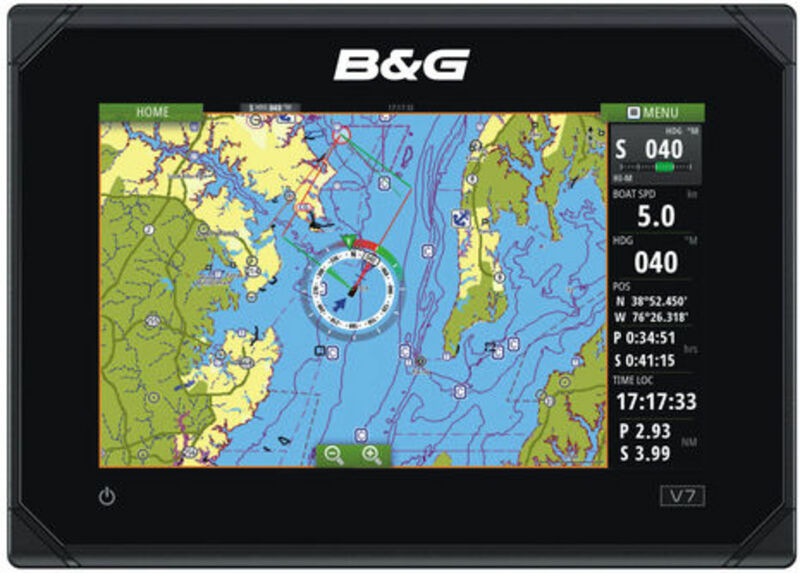 The Vulcan 7 also introduces the SailSteer Overlay seen above, though I believe it will be coming to other B&G MFDs in a firmware update. 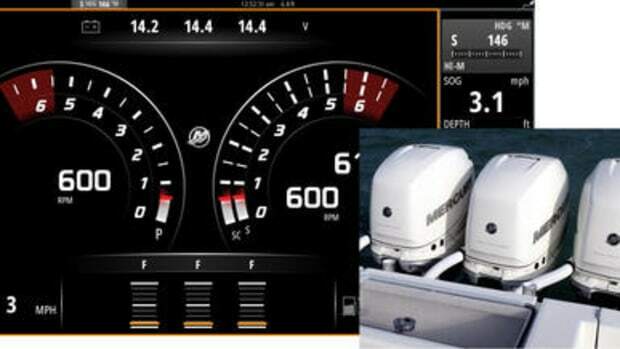 Note the Sailing Time tack distances and ETA&apos;s on the databar and that the more familiar full panel SailSteer graphic is also available. 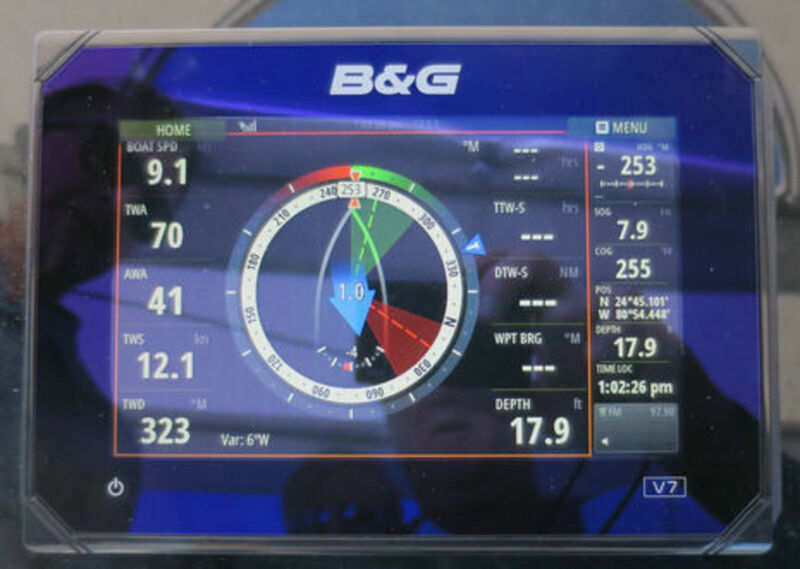 In fact, the SailSteer graphic has been improved since I first saw it in Las Palmas, and the Vulcan also seems to fufill the promise made there that B&G sailing aids would become more available to sailors on a budget. But Vulcan can also have a relationship with B&G&apos;s higher end gear. 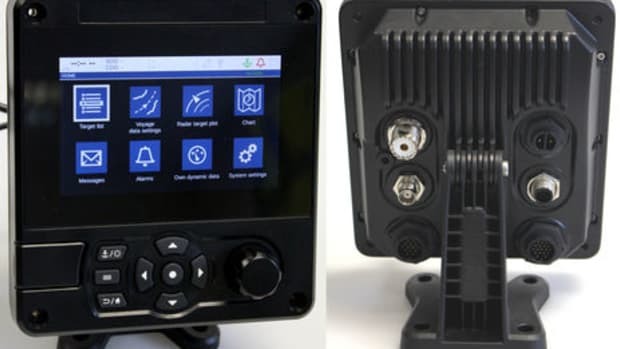 I hesitate to show this picture because the feature is not mentioned at all on the current Vulcan V7 product page, but full integration with the H5000 instrument system is definitely in the works. 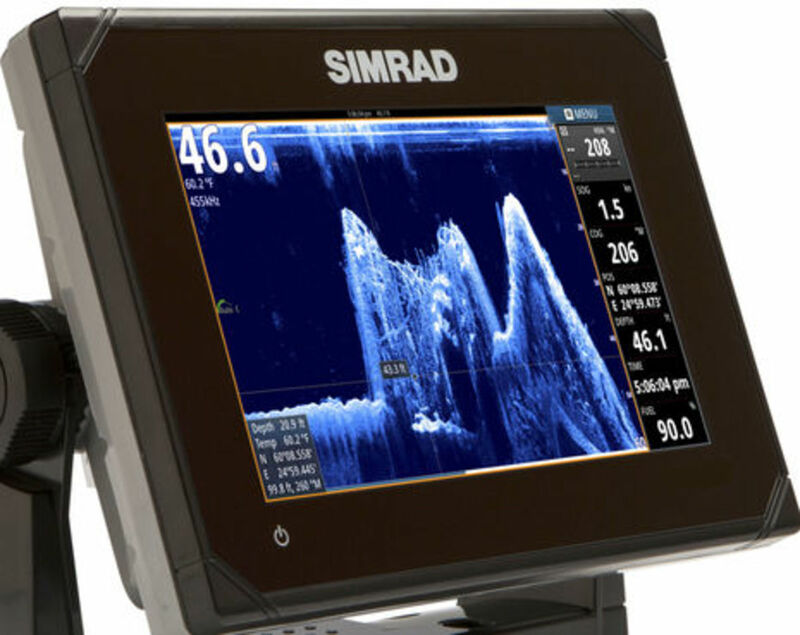 What&apos;s also not mentioned on those Vulcan pages (except for the specs) is sonar, but I&apos;ve confirmed that the V7 has the same CHIRP and DownScan capabilities as the Simrad Go7. 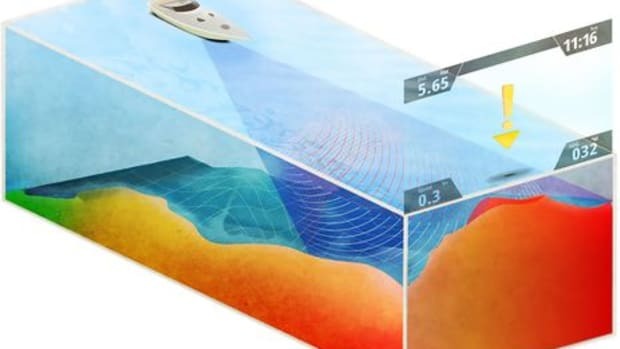 In fact, the Vulcan press release mentions "a unique perspective on what&apos;s beneath the boat, thanks to Cruise Sonar - a picture-like representation of bottom structure"...but I&apos;m not sure if that&apos;s different than the DownScan image below. 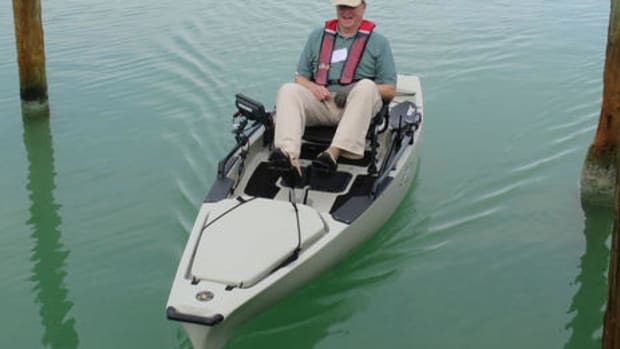 I&apos;m sure there&apos;s more to learn about the Vulcan V7 and Go7, but so far I think they look great as long as the user understands what they can and cannot do. What do you think, and what&apos;s a better term for this MFD design than "standalone"?